The YKK Widnes Wild are pleased to announce that Mike Mawer will be returning to the club for the forthcoming 2018/19 Laidler Division season. 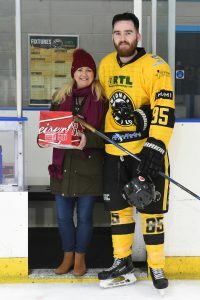 The 6’2″ forward comes from Grimsby and played for Grimsby junior teams before switching to Sheffield where he played 4 seasons in the ENL / NIHL for the Senators and Spartans teams, scoring 22 goals in 113 games. He has played 64 games for the Wild, scoring 6+11 and notching up 98 penalty minutes. Mike has also played for the Great Britain Universities team at the Winter Universiade games. Mike will once again wear the number 85 shirt and his home, away and warm-up shirts are available to own ‘n’ loan here. The YKK Widnes Wild still have season tickets available starting at £60 and further information is available on the YKK Widnes Wild Website or from Planet Ice Widnes.